Analysis of the present forestry in terms of its biodiversity value. The document places more value we feel on economic rather than biodiversity/ecological desired outcomes. The existing forestry is mainly monoculture based which is opposite to the concept of biodiversity. Based in the main on one non native exotic conifer, the Sitka Spruce and other conifers the outcomes are acidic seriously affecting in many areas the spawning grounds in rivers and the fishing industry. Being plantation forestry based mainly on monoculture and alien single species which have been imported into the country without the supporting wildlife and predation associated with the species in their natural native habitats, they are susceptible to attack mainly from the pine weevil. Because of the lack of natural systems of predation dangerous pesticides are used which are carcinogenic, persistent and damage immune systems. We feel that a hundred year biodiversity plan for forestry should be set out which would provide for the move from the present system to one based in the main on our native hardwood trees which provide for the maximum amount of biodiversity. This could be achieved over such a period. This would provide for a paradigm with provision for a continuous canopy approach, with Sylva culture and permaculture principles stitched into the plan all of which would be most beneficial in promoting biodiversity. Present practices of clear felling should be addressed which result in serious losses of biodiversity. It is a fact which should be a key determining factor in devising a plan that our native hardwood trees provide for maximum biodiversity. The advocacy of agro-forestry should be more strongly emphasised in a forestry biodiversity plan and in the context agro-forestry/horticulture’s potential to help the move towards food sovereignty. Trees/forestry as sources of food not only for wildlife but also for the human population should be a considerable part of a national biodiversity plan. It should be stated that the density of existing plantation conifer forestry does not permit sufficient light to reach the forest floor resulting in a dearth of ground flora. Forest Friends strongly maintain that a plan for forestry cannot be complete without an assessment of the role which hemp could play. Hemp has been described as a miracle plant with perhaps more diverse uses than any other with potential in the spheres of food, medicine, construction, paper, bio fuel source, clothes, etc. Cropping is most frequent and its utilisation would reduce the necessity of felling large tracts of forest. The city forest should be addressed and in terms of biodiversity areas deprived sociologically are also deficient in tree biodiversity and biodiversity in general. The community as stakeholders should be more prominent in developing the plan which does not appear to be the case. The plan should optimise the role of communities as stakeholder. The percentage of tree cover of itself is not an adequate measure of progress in forestry. The development of cooperatives should be an important emphasis in the plan and best practice in that regard should be outlined and described. Forest Friends are of the view that a clear roadmap should be set out based on the biodiversity principles of the Earth Conference held in Rio de Janeiro in 1992, which we believe would entail a move away from monoculture plantation forestry to one based on our native hardwood trees mainly. In any case a number of scenarios should be outlined and weighted on the basis of biodiversity principles which would result in identifying the optimum solution in biodiversity terms. Economic and social equity principles could be integrated in the weighting process for the best outcome in a fully comprehensive paradigm. Finally Forest Friends Ireland hereby submits the following which are relevant to this consultation process with regard to the National Biodiversity Plan 2017-2021. 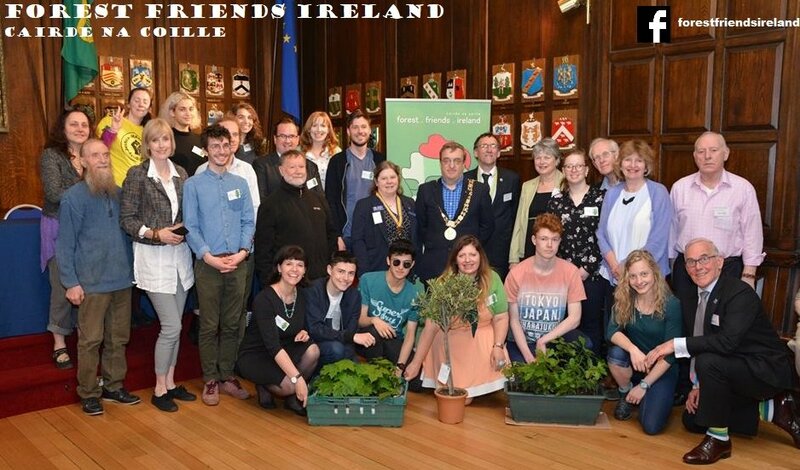 It is with regard to the Peace Forest Ireland Project which Forest Friends have been pioneering whereby peace tree plantings have taken place in all the border counties between 2014 and 2016. An intrinsic part of the project is the creation of for Forest Biodiversity. During the present planting season 4,000 peace trees will be planted in memory of all those who lost their lives in the Northern Ireland conflict. 2,000 of these will be planted in the Irish Republic sponsored by Coillte and 2,000 will be planted in Northern Ireland sponsored by the Woodland Trust Northern Ireland. These peace trees will be planted in or around National Tree Week March 5-12 2017. To assist the process of planning and development of this module of the peace forest, advertising will be placed in the local newspapers in each Border County explaining what are envisaged and inviting ideas, and promoting involvement and support. Partnerships will be encouraged to assist all aspects and stages of the peace forest project and to assist in the sourcing of suitable sites". 40 Lower Drumcondra Road Drumcondra Dublin.